Braveling came up with the clever concept of introducing fun, playful tights specifically designed for boys. They wanted something that their little boy could wear that would allow him to move and crawl as much as he wanted without being constricted. That is when Braveling was invented! 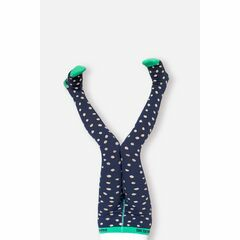 These tights will delight little girls and boys with their funky and eye catching designs, they are well designed with extra thick feet for warmth and non-slip soles. The perfect and practical gift for a toddler that is always on the move!